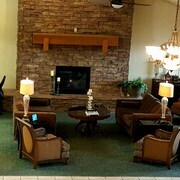 Excellent no complaints, compliment breakfast awesome, the beds very clean and comfortable. Where to find Dodge City hotels near an airport? 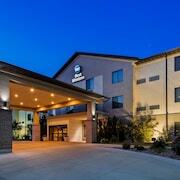 Where can I find hotels in Dodge City that are near tourist attractions? Hotels near The Big Pool: World's Largest Hand Dug Swimming Pool"
Tourists in Western Kansas who are seeking hotels and apartments in and around Dodge City have many choices. At the moment, Expedia's booking portal features 14 hotels to base yourself within a 0.1-kilometre (0.06-mile) distance of Dodge City's downtown area. 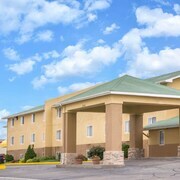 Accommodations that are within easy walking distance of the center of Dodge City, are the Hampton Inn & Suites Dodge City and Stay Suites of America Dodge City. Expedia know that all travelers have differing budgets and needs. So if you're searching for a hotel at the more affordable end of the range, Dodge City features some solid options to choose from. 2 kilometres (1 mile) from Dodge City's downtown area is the Super 8 Dodge City. The Dodge House Hotel & Convention Center is only 3 kilometres (2 miles) away. The Americas Best Value Inn Garden City and the Travelodge Dodge City are two other lower-cost accommodations that deserve a look. 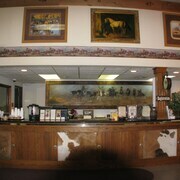 The Best Western Plus Country Inn & Suites is positioned 2 kilometres (1 mile) from the center of Dodge City. Or, alternatively, the La Quinta Inn & Suites Dodge City is situated 3 kilometres (2 miles) away. The Dodge City Inn and also the Nendels Inn and Suites are some alternative accommodation options worth checking out around Dodge City. Why don't you explore the many delights of Western Kansas while you are here? Western Kansas is marked by prairies, and commonly visited Western Kansas sights include farms. In this part of United States of America visitors might enjoy horse riding and cycling. 75 kilometres (46 miles) from Dodge City you'll find Garden City, where you can spend the day visiting Lee Richardson Zoo and Finney County Historical Museum. 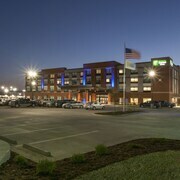 The Hampton Inn Garden City and Comfort Inn Garden City are a few of the short and long-stay alternatives in Garden City. Or stay in Greensburg, 65 kilometres (41 miles) to the east of Dodge City, where you can choose from the Best Western Plus Night Watchman Inn & Suites and Greensburg Inn. Regardless of whether you're passing through or spending a few nights in Greensburg, set aside a little time to check out the Kiowa County State Park and Davis Park. Dodge City Regional Airport is a logical airport for flying into Dodge City. It is 5 kilometres (3 miles) away. 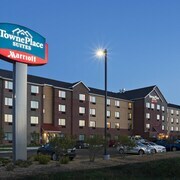 TownePlace Suites by Marriott Dodge City is a nearby hotel. What are the most popular Dodge City hotels? Are there hotels in other cities near Dodge City? 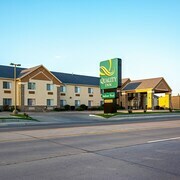 What other types of accommodations are available in Dodge City? Explore Dodge City with Expedia.ca’s Travel Guides to find the best flights, cars, holiday packages and more!